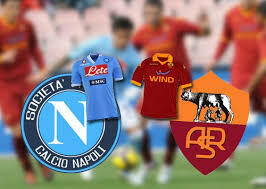 Napoli hosts Roma in the big derby of the 10th round of the Serie A. This match is going to be played at the Stadio San Paolo in Naples on Sunday night. Napoli are currently second in the Serie A with 21 points, trailing on 7 points behind the leader Juventus, but also having a game in hand. As it stands now, Carlo Ancelotti’s team is going to be Juve’s main contender for the Scudetto. Right now Napoli have a record of 7 wins and 2 losses. In their last five matches they won four times and suffered only one defeat – against Juventus. After the loss in Turin, the Azzurri enjoyed a run of two consecutive wins over Sassuolo and Udinese. During the week Napoli also had a game in the Champions League, doing a 2-2 draw during the visit to PSG in Paris. The Italian team was very close to win this game, but PSG equalized with a late goal from Angel Di Maria. Roma are 7th in the Serie A with 14 points won until now. The Wolves have a record of 4 wins, 2 draws and 3 defeats. They probably hoped to be much more consistent since the start of the season. In their last game in the Calcio Roma suffered a loss. Eusebio Di Francesco’s team was surprisingly beaten by SPAL at the Stadio Olimpico. Nobody really expected something like this to happen, but it happened. During the week Roma also had a match in the Champions League, enjoying a 3-0 win over CSKA Moscow in the capital. This is our preview for the Serie A derby between Napoli and Roma at the San Paolo. We think Napoli have advantage here, but against Roma it’s going to be a really tough fight for them.